The Cormorant is an unmanned aircraft to be used on different types of missions, mainly as a reconnaissance and troop support. 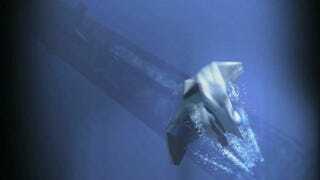 It uses a turbo-fan engine for flying, which of course can't be put underwater. The trip from the submarine to the surface works using physics: when the missile bay opens, the Cormorant starts ascending like a cork, thanks to the pressure difference. During this time, the engine inlet is sealed. When the plane reaches the surface, it jumps out of it because of the acceleration and, precisely when it is in midair, two rockets fire up to get it off the surface. When the necessary speed is achieved, the turbo-fan fires up and the rockets are ejected. From that point, the UAV follows its trajectory and executes its mission, returning to sea after it's done. When it reaches the programmed rendezvous point, the engine stops, a parachute deploys, and it falls into the water to wait for the submarine to retrieve it. The submarine, however, doesn't have to come to the surface at any time. Instead, it would launch another robot, which will hook the Cormorant to the sub using a cable. The submarine will then tow the plane down and put it back in its bay.